During the session this year I did a number of presentations of a slideshow on how people evade taxes in Washington and the key points of a bill that would limit the ability for some of these scams to work. Eventually I recorded the show so that other people could see it. This is my first cut at the “new media” approach to politics so it’s not that good yet, (e.g. it’s too long) but enough people wanted access that I’m posting it here. 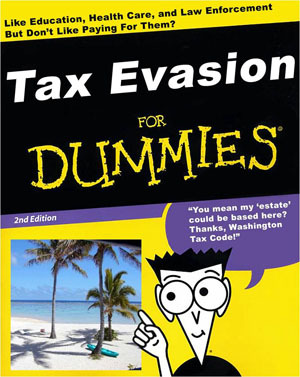 You can search youtube for “tax evasion for dummies”. And, barring blogging software disasters you can watch it here. 1 Comment on "Tax Evasion for Dummies, the video"
Hey I stumbled onto your blog while I was looking through http://www.yachtexports.com. Looks promising! Keep up the good work!